The age of predictive maintenance and big data is just beginning, and the future will see aircraft generating ever more data, with more plentiful and smarter sensors and monitoring systems. This will be true for engines— where data collection began—and across a wide variety of aircraft components and possibly airframe structures that so far have been the most difficult components to monitor. New sensor connections, wireless or transmissible directly to communication buses, are also possible. Esterline makes sensors for several aircraft components including engines, which are the most hostile sensing environment, according to James Ewing, vice president of engineering for advanced sensors. One major goal is to handle the increasing temperatures and pressures to which engine sensors are subject. Engine OEMs are increasing pressures and temperatures to boost fuel efficiency, and Esterline must make sure its sensors can take the added punishment in engine hot sections, often by using exotic new materials and expensive alloys. Reducing drift means reducing some sensors’ tendency for performance degradation over time; for example, expressing an increased metric even when true engine performance is unchanged. Reliable accuracy from sensors will allow engines to be operated under the most efficient conditions, without fear that deterioration goes undetected. Some sensors in hot sections are now replaced every five or six years. Airlines would like to lengthen or eliminate these replacement cycles entirely. 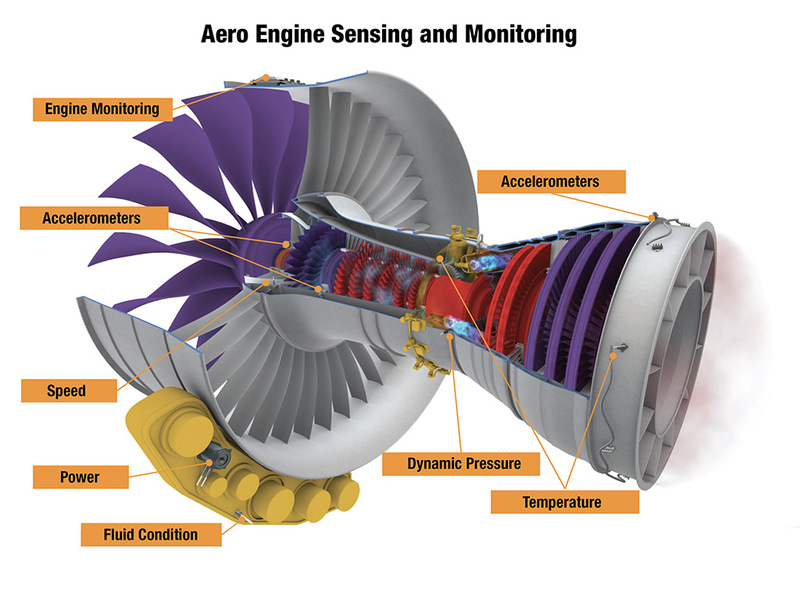 Wireless sensors are used chiefly for testing engines under development, when a lot of data points are needed. In the future, to reduce weight and space used for wiring, sensors may transmit data wirelessly on operating engines. Wireless sensors need to harvest energy or tap local power sources. Engines generate powerful vibrations, but the challenge is to convert vibrations into usable power for sensors. Another change might be distributing FADEC so sensors will need shorter connections. Rolls-Royce is considering dividing up FADEC into separate parts, which would reduce the amount of wiring needed to connect sensors. Ewing expects sensors also will serve new uses. For example, for engine efficiency, sensors could measure turbine-blade clearances. The gap between tip and case determines air leakage and thus engine efficiency. For safety purposes, sensors might measure the timing of turbine-blade tips. Changes in spinning speed or vibration could flag a bird strike or other foreign object damage that creates a risk to aircraft safety. Ewing believes increased aircraft reliance on electric power will require sensors for battery health monitoring. In the future, both more and different types of aircraft sensors likely will be required, says Lucas Sendra, Meggitt business development manager. Meggitt products include brakes, fire controls, bleed air valves, heat exchangers, fuel systems, engine components and sensing systems. New technologies like optical and surface acoustic-wave sensing will enable new parameters to be monitored, he predicts. And more-electric aircraft will require new sensors to monitor electric motor performance. “Future monitoring systems will combine legacy sensors, smart and wireless sensors and new sensing technologies,” he says. For example, Meggitt is working with Airbus and Textron on wireless tire-pressure monitoring systems that can transmit data up to 50 m (164 ft.), so mechanics won’t have to crawl around landing gear checking tire pressure. Curtiss-Wright makes sensors for engine-fuel control, flight controls and critical-condition monitoring. The company is seeing more sensors being deployed for safety, efficiency, situational and health monitoring. “One of the strongest drivers . . . including retrofits, is . . . safety monitoring such as slat-skew, stall, engine-cowling position or thrust-reverser deployment,” says Graham Macdonald, senior vice president of sensors and controls. Curtiss-Wright recently delivered a suite of slat-skew detection sensors, placed on individual slats to increase accuracy. Sensors typically interface with local control systems or data concentrators, which then interface with the communications bus. In many cases, sensors could eventually interface directly with the bus. Macdonald expects wireless sensors to become more attractive, especially in flight-test instruments and noncritical applications. The holy grail of health monitoring has been monitoring aircraft structures. This goal may be getting a little closer with Structural Monitoring Systems’ Comparative Vacuum Monitoring (CVM). CVM can test structural health on the ground, replacing time-consuming visual inspections. CVM uses Teflon tape that has elastomeric sensors with fine channels etched in the adhesive face. The tape is applied to an aircraft, explains Richard Poutier, vice president for business development at Structural Monitoring Systems. During an inspection, equipment draws a vacuum over several channels of the tape. If there are any surface cracks, channels will leak air, and the equipment will detect the leak and pinpoint the crack location. CVM has been proven to work on aluminum structures and is being tested on composites. It can be retrofitted on any structure on which mechanics can lay the tape and has been approved to check the health of wingboxes on the Boeing 737. One U.S. airline has installed the tape on seven 737s and used it for 120 inspections. Several others are evaluating it. “CVM has been accepted by Boeing and included as an alternative method of compliance,” Poutier explains. “It avoids ripping up floorboards and taking out seats to inspect the wingbox.” He estimates CVM has saved $150,000 in lost revenue per aircraft during a heavy check by speeding up inspections. Structural now offers CVM for inspections required by airworthiness directives and service bulletins. Longer term, it wants to deploy the technology for routine inspections. Eventually, it might be used to monitor inflight structural health. CVM can detect surface cracks and measure their length. Only eddy current inspections can at present detect subsurface cracks. Poutier says OEMs may learn to judge structural integrity by surface cracks and run a CVM test every 500 cycles to remain confident about the safety of components. The natural next step is to install CVM as a line fit in new aircraft. According to Poutier, several OEMs are now considering this.